The town of Iowa Park was platted in 1888 on the route of the Fort Worth and Denver City Railroad. 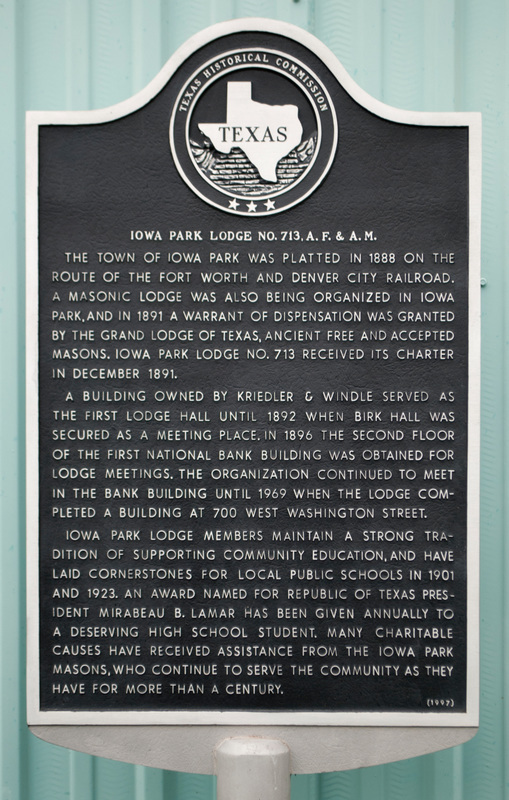 A Masonic Lodge was also being organized in Iowa Park, and in 1891 a warrant of dispensation was granted by the Grand Lodge of Texas, Ancient Free and Accepted Masons. Iowa Park Lodge No. 713 received its charter in December 1891. A building owned by Kreidler & Windle served as the first lodge hall until 1892 when Birk Hall was secured as a meeting place. In 1896 the second floor of the First National Bank building was obtained for lodge meetings. The organization continued to meet in the bank building until 1969 when the lodge completed a building at 700 West Washington Street. Located at 700 West Washington Street, Iowa Park, Texas 76367. GPS coordinates: 33-degrees, 57' 16.3" -98-degrees 40' 40.8".